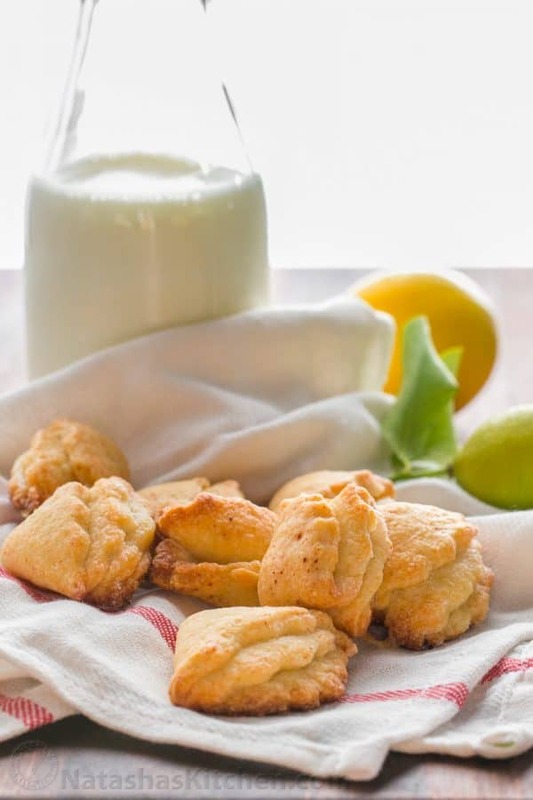 These cottage cheese cookies are lightly sweet, crisp and crumbly. They are just right with a piping hot cup of tea (or coffee). They are also excellent with milk. I took them to my sisters house tonight and we spread raspberry honey creme over the top and proceeded to wolf them down like it’s nobody’s business. Her 7-month-old also gummed the lights out of one and needed a bath afterwards. He’s such a cute goober. I wish I had snapped a picture of him with his cookie. I love discovering new blogs. I especially love finding European-type blogs because it’s very likely that we have foods in common. 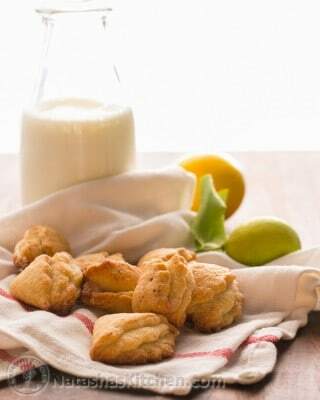 Last week, I came across One Turkmen Kitchen and that is where I found the original cottage cheese cookies recipe. My only changes: I converted everything to US measurements and added lemon zest (because I have like a gazillion lemons from our trip to California). Preheat your Oven to 350˚F. Line a cookie sheet with parchment paper. 1. 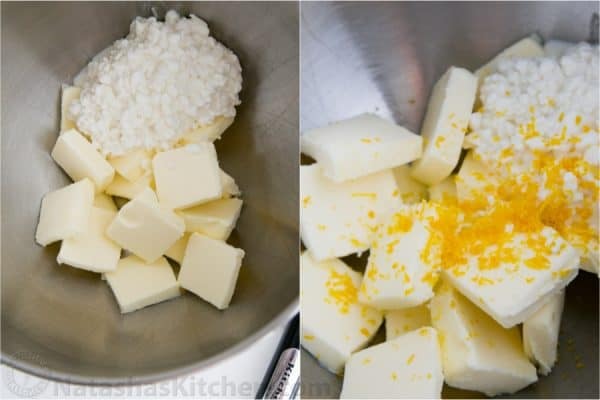 In the bowl of your stand mixer with the paddle attachment, cream together your softened butter, 8 oz small-curd cottage cheese and the zest of one lemon. 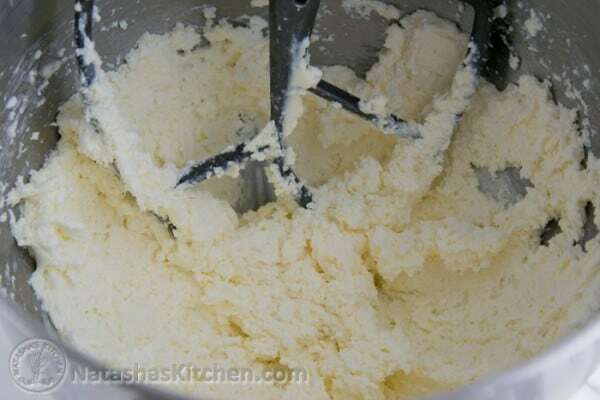 Mix on Medium/high speed for about 5 minutes until the mixture is smooth and fluffy. 2. 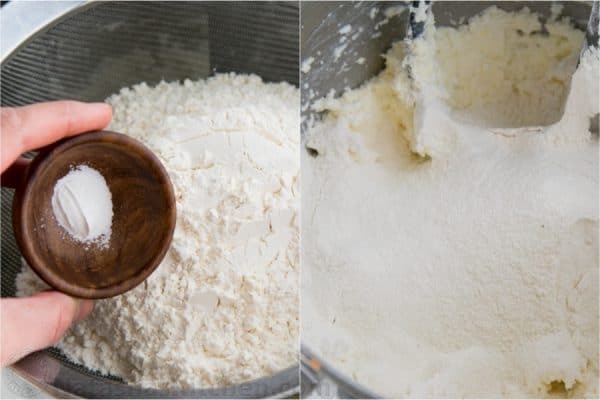 Sift in the 2 1/4 cups flour and 1/4 tsp baking powder (or whisk together flour and baking powder instead of sifting) and knead it together with your dough hook or by hand until your dough is soft and not sticking to your fingers. If you find it is still sticking to your fingers, add another Tbsp of flour. 3. 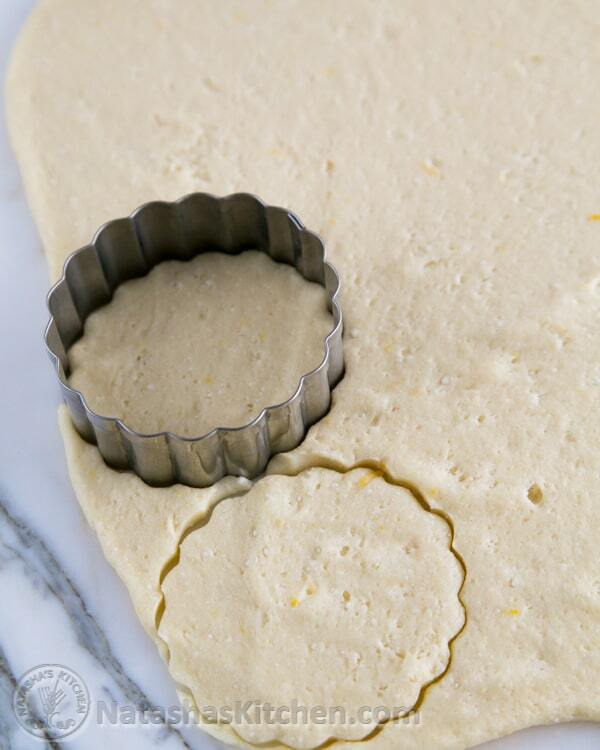 Roll the dough into a ball and then roll it out on a smooth, non-stick surface until it is 1/4″ thick. 4. 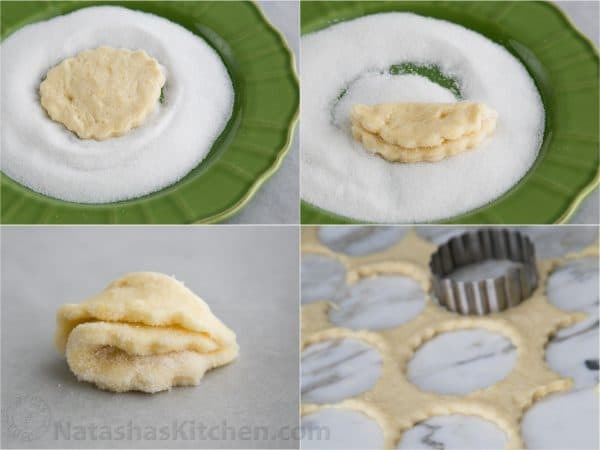 Use a round cookie cutter to cut out your cookies, cutting as many as you can out of your dough. 5. Pour your sugar into a flat plate. Dip one side of your cookie into the sugar and gently pat it down to coat generously with sugar. Fold it in half with the sugar on the inside. Dip one of the folded sides of your cookie in the sugar again and fold it in half with the sugar on the inside. When you fold, the sugar will always be on the inside. If you accidentally dip both sides of your cookie in sugar (I did a couple times) don’t panic, it will still be edible. Place the finished cookies on the baking sheet, fairly close together, since they don’t expand very much. 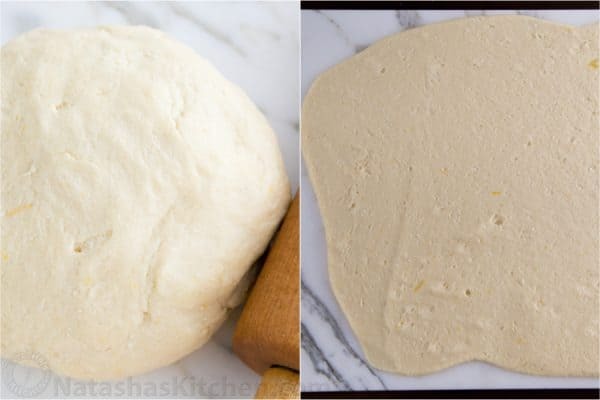 Make a ball of dough out of the remaining scraps and roll it out again and again until you’ve used up all of your dough. 6. Bake at 350˚F for 32-35 minutes or until the edges and tops are golden brown. Are you making any any new cookies for the holidays? 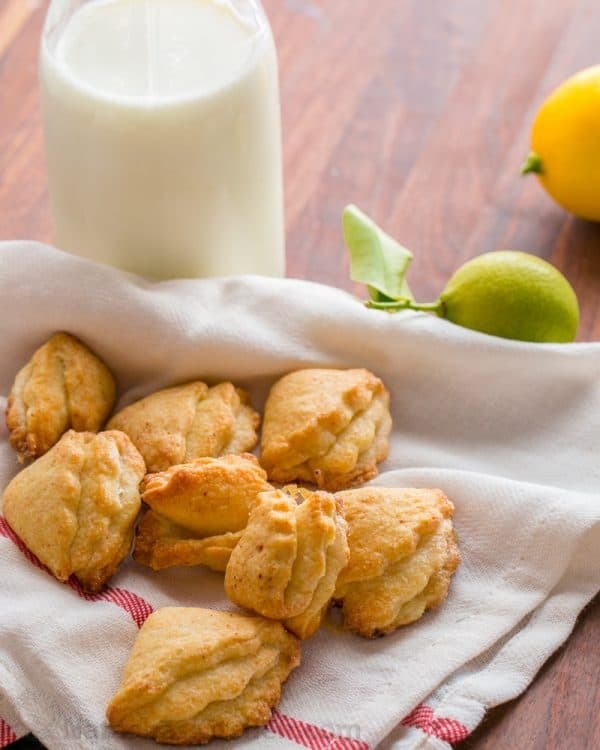 These cottage cheese cookies are lightly sweet, crisp and crumbly. They are just right with a piping hot cup of tea (or coffee; you see, I don't discriminate). They are also excellent with milk. 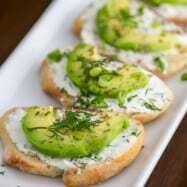 In the bowl of your mixer with the paddle attachment, cream together your softened butter, 8 oz small-curd cottage cheese and the zest of one lemon. Mix on Medium/high speed for about 5 minutes until the mixture is smooth and fluffy. 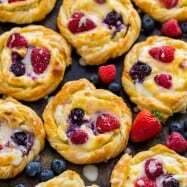 Sift in the flour and baking powder (or whisk together flour and baking powder instead of sifting) and knead it together with your dough hook or by hand until your dough is soft and not sticking to your fingers. 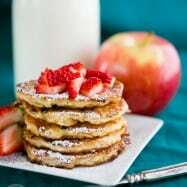 If you find it is still sticking to your fingers, add another Tbsp of flour. Roll the dough into a ball and then roll it out on a smooth, non-stick surface until it is 1/4" thick. 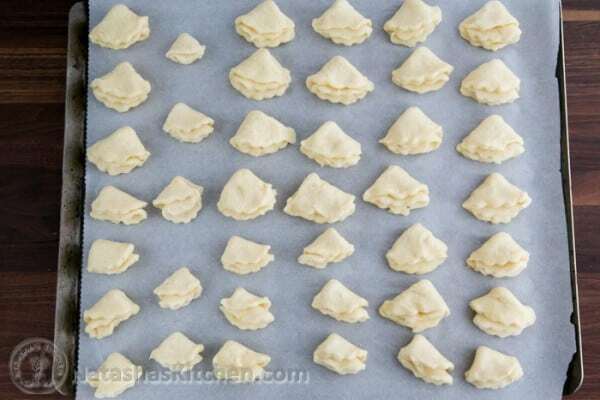 Use a round cookie cutter to cut out your cookies, cutting as many as you can out of your dough. Pour your sugar into a flat plate. 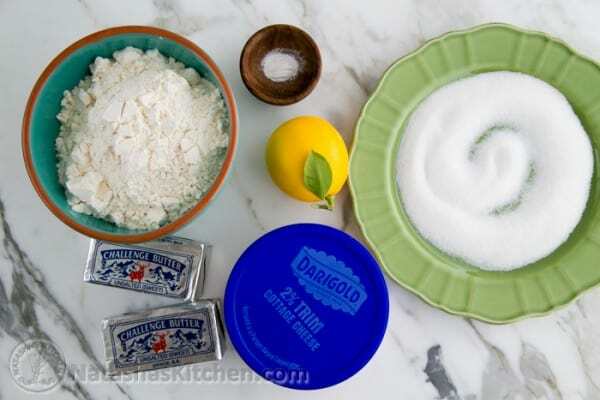 Dip one side of your cookie into the sugar and gently pat it down to coat generously with sugar. Fold it in half with the sugar on the inside. Dip one of the folded sides of your cookie in the sugar again and fold it in half with the sugar on the inside. When you fold, the sugar will always be on the inside. If you accidentally dip both sides of your cookie in sugar (I did a couple times) don't panic, it will still be edible. Place the finished cookies on the baking sheet, fairly close together, since they don't expand very much. 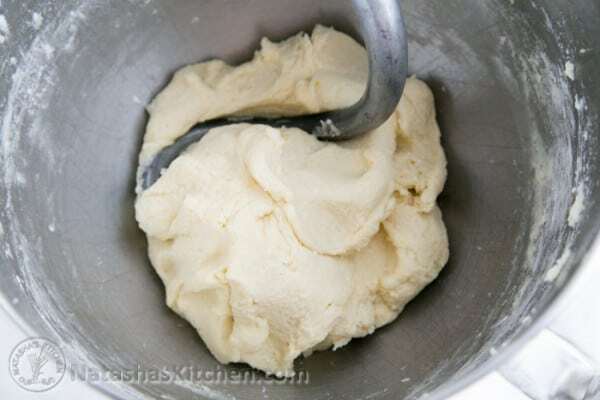 Make a ball of dough out of the remaining scraps and roll it out again and again until you've used up all of your dough. Bake at 350˚F for 32-35 minutes or until the edges and tops are golden brown. 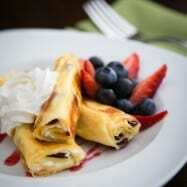 I made these last night and YUMM, love that they are slightly sweet! 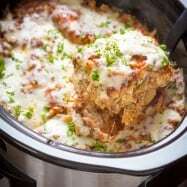 And such an easy recipe! I didn’t have lemon so I added vanilla extract. Q: Do you rinse the cottage cheese? 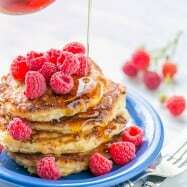 Do you think if I substitute flour with almond floor, the cookies will turn out ok? I’m allergic to gluten. Also, instead of sugar to use honey? My version of these cookies…so delicious! I’ll have to try your version Marina! I wonder if the higher heat makes them flakier too? Thank you for the tip Marina, I should try that next time :).